This activity enables you to specify one or more activities to be performed concurrently. A flow activity completes when all activities in the flow have finished processing. Completion of a flow activity includes the possibility that it can be skipped if its enabling condition is false. For example, assume you use a flow activity to enable two loan offer providers (United Loan service and Star Loan service) to start in parallel. In this case, the flow activity contains two parallel activities – the sequence to invoke the United Loan service and the sequence to invoke the Star Loan service. Each service can take an arbitrary amount of time to complete their loan processes. Figure A-14 shows an initial flow activity with its two panels for parallel processing. 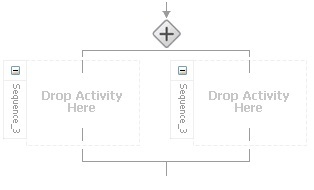 You drag activities into both panels to create parallel processing. When complete, a flow activity looks like that shown in Figure A-15. 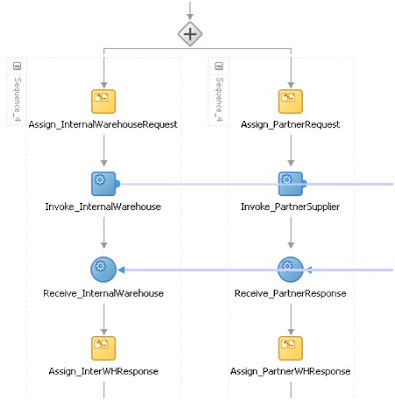 You can also synchronize the execution of activities within a flow activity. This ensures that certain actives only execute after other activities have completed. Oracle's BPEL implementation executes flows in the same, single execution thread of the BPEL process and not in separate threads. Hello! How do you think what is your common reading audience?